What if I told you there was a website where you could buy your favourite high street brands for a fraction of the price? A Warehouse coat for £15, a Miss Selfridge skirt for £6.50 or a Topshop dress for £10? You probably think I'm talking about some fallen off the back a lorry scheme, but I'm not! I'm talking about my new favourite place to get a good quality bargain: High Street Outlet. When they first contacted me about a collaboration for the blog I was a bit skeptical, I'd heard of these types of things before but never really imagined you could get anything decent from them. I don't like to say this very often but, I was wrong, as you'll see from the pictures of the dress I got later in the post! What is High Street Outlet? Julie Burden and her sister Katrina Day set up High Street Outlet back in 2007 (in there spare room like many start ups!). After finding a local supplier and trailing a few lines of clothing to sell online they soon realised there was a big market for past season and stock overruns of clothing that originated from popular high street stores such as Topshop and Monsoon, especially as they could offer them with massive discounts. Their stock is sourced from places like factories which over make on clothes orders by at least 10%, whilst some of the stock comes from cancelled orders or past season ranges. The majority of the items have their labels removed (to prevent them being returned to stores) but other than that they are exactly the same as what you'd find in the shops. Fast forward to 2015 and they now have a massive warehouse in Poole where they house stock from brands such as Dorothy Perkins, Asos, White Stuff, M&S, Topshop, and much more - all with a massive saving on RRP. They also host an exciting warehouse sale on the first Saturday of every month which attracts queues of people wanting to get in and grab a bargain. As I mentioned earlier, when I first started browsing the site for the first time I didn't expect to find anything exciting. Maybe a simple top or pair of trousers which I could style up, but then I came across this absolute BEAUT of a Topshop dress. Something I would definitely have snapped up if I had seen it in store...but for just £10! After picking the dress online it arrived a few days later and once again I was surprised - the quality was spot on - there weren't any marks or faults, it was a typical pretty Topshop dress just without the label. I loved the pretty crotchet detailing on this dress especially around the neck, I ditched jewellery as I thought the detail was enough, but did accessorise with a brown New Look belt to pinch it at the waist. 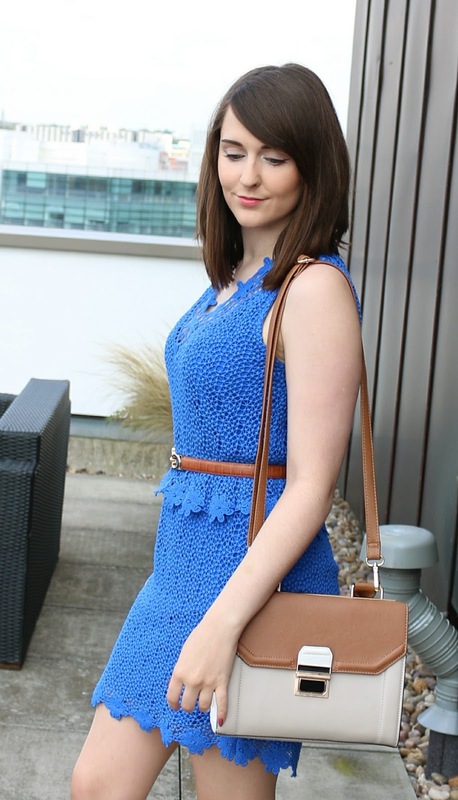 I always think brown works really well with the deep royal blue colour, so I wore it with my trusty brown Topshop clog heels (£56.00) and a brown structured New Look bag (£19.99). I think it created a super smart look which would be ideal for work or business meetings. You can find the bargain Topshop dress here. So my final verdict on High Street Outlet? Well, it's a great thing to be in the know about and I'll be certainly be keeping an eye on the site for further bargains at my favourite high street retailers. There's something fun about walking around in a quality high street piece, knowing you got it for a fraction of the price! Hope you enjoyed the post and let me know your thoughts on High Street Outlet. I just love when you wear these clog shoes, I think they're so cute! I love a great outlet store. We have quite a few of them here in the States and as long as you don't mind that some items are not the current season you can score some great deals. I love how you accessorized your Topshop dress and that bag is a must-have.